Editor’s Note: Despite the fact that Adobe is retiring the name “SiteCatalyst,” it will take me a while to adjust to that change so I will continue to refer to the product as such. How often does cross-sell occur (in general)? Which products are added to the cart via cross-sell? Which products cross-sell each other? Which product categories cross-sell each other? In this post, I will share some ways you can answer these questions using SiteCatalyst. The first step in tracking product cross-sell is to set-up your implementation in a way that can report upon Cross-Sell Cart Additions and capture which products are being cross-sold. To do this, let’s go through an example. Let’s imagine you work for AVG. 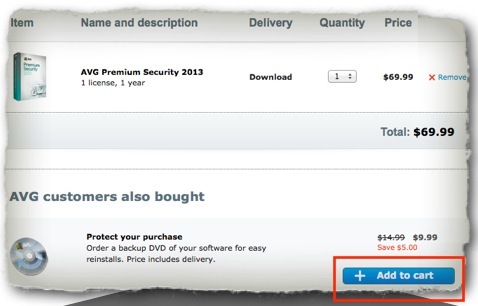 As shown below, a visitor has just added the AVG Security 2013 product to the shopping cart. While there, the visitor sees a cross-sell for the Backup DVD product. If the visitor clicks the Add to Cart button for the Backup DVD product, it should be counted as a Cross-Sell Cart Addition. We would also want to capture which product drove the DVD Backup Cross-Sell Cart Addition. In the report above, we can see that the Backup DVD was sold without cross-sell approximately 95% of the time. For the remaining 5%, we can see which products drove its addition to the cart and ultimately its purchase. 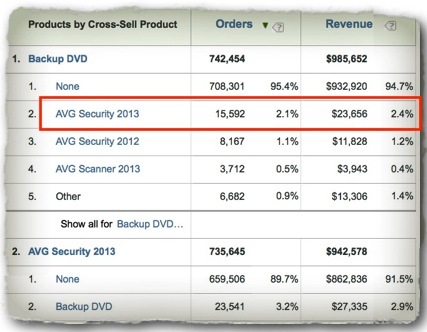 Here we can see that the AVG Security 2013 product is the top cross-seller of the Backup DVD product. Obviously, we can view the converse of this report by opening the Cross-Sell Product report and breaking it down by product to see what other products the AVG Security 2013 product cross-sold. Another thing you may notice is that I set an additional success event (event30) in the above syntax. I did this so that I can have a metric that captures how often Cross-Sell Cart Additions took place. The scAdd success event captures all Cart Additions, but you would only set event 30 when the Cart Addition is the result of a Cross-Sell. 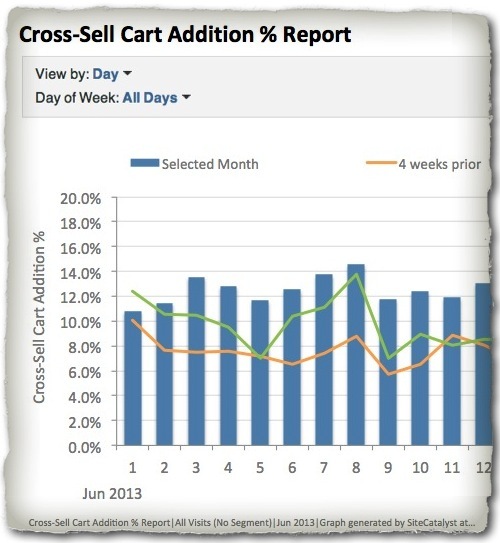 This event 30 allows you to trend Cross-Sell Cart Additions and you can add it to the Cross-Sell Product eVar report to see how often each product drove visitors to click the Cross-Sell button. This can then be compared to Orders to see Cross-Sell conversion by product. You can also use this additional Cross-Sell Cart Additions success event is to create a Calculated Metric to quantify what percent of all Cart Additions are Cross-Sell Cart Additions (Cross-Sell Cart Additions/Cart Additions). This is easily trended and you might have merchandisers set internal targets or goals to increase this via Test&Target or other tools. If desired, you can also see cross-sell of product categories. If you are a good SiteCatalyst administrator, you should already be using SAINT Classifications to group products into product categories. If you are doing this, then you can view the above product cross-sell report by product category to see how well one product category is doing at cross-selling another product category. Using the example above, if we classified the AVG Security 2013 product into the Security product category and the Backup DVD product was classified into the Backup product category, we could see how often the Security Category cross-sells the Backup Category. As an aside, if you are using a Merchandising variable to capture “Finding Methods” (capturing the method that visitors used to find products they ultimately purchase), you want to be sure that when the Cross-Sell Cart Addition Click success event you set a value of “Cross-Sell” to the Finding Methods eVar. This will allow you to bind each product driven by cross-sell appropriately. So there you have it. Some ideas of you to ponder as you think about product cross-sell on your website. If you have any questions or additions, feel free to leave a comment here. Thanks! The out-of-box cross-sell report simply shows you what products are purchased concurrently so it doesn’t show influence of cross-sell content…. Can we add a product view each time a cross sell is shown, so that we can compare it to cart adds and then purchases? I would not add a Product View (since you don’t want to inflate your Product View count), but you could certainly set a custom success event when they click and call it something like “Cross-Sell Clicks” to compare it to Cart Additions and Purchases (by product). Good article Adam! I have one question: and in case the cross-selled product needs form the visitor to select a variant (e.g. size, color, etc…)? Supposing that the variant can be selected only from the product page, so the cross-selled product can not be added directly to the cart.